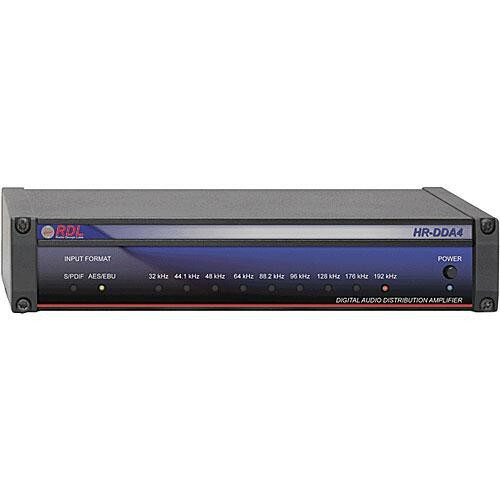 The HR-DDA4 Digital Audio Distributor from RDL is ideal for installations which need high-quality distribution of digital audio signals. This 1 x 4 distributor supports AES/EBU, S/PDIF or AES-3ID formats for both inputs and outputs. The front-panel displays sample rate and format while input is decoded, reclocked and retransmitted to up to four individually buffered outputs. The input automatically selects the input source with each output having switch-selectable connections for AES/EBU, S/PDIF coaxial or AES-3ID outputs. HR-DDA4 Digital Audio Distributor is rated 3.0 out of 5 by 1. Rated 3 out of 5 by rmanard1 from Make sure you order the power supply too Good product and works well, but should sell with the power supply, since you need it to work the unit.